How Often Should I Give My Newf A Bath? Normally when I post a picture of Sherman or Leroy getting a bath I get asked how often I bathe them. I always think that this is one of those questions that doesn’t have a straight forward answer. All dogs are different and it depends on the dog’s coat, what activities they are doing and how dirty they are. I bathe Sherman and Leroy about every 3-4 months. Sherman and Leroy get a bath about once a week during show season. Sherman and Leroy get a bath as needed. If they stink, if they feel dirty, if they have blowout diarrhea, if they roll in poop, if they get super muddy or if Sherman has crusty slobber legs. 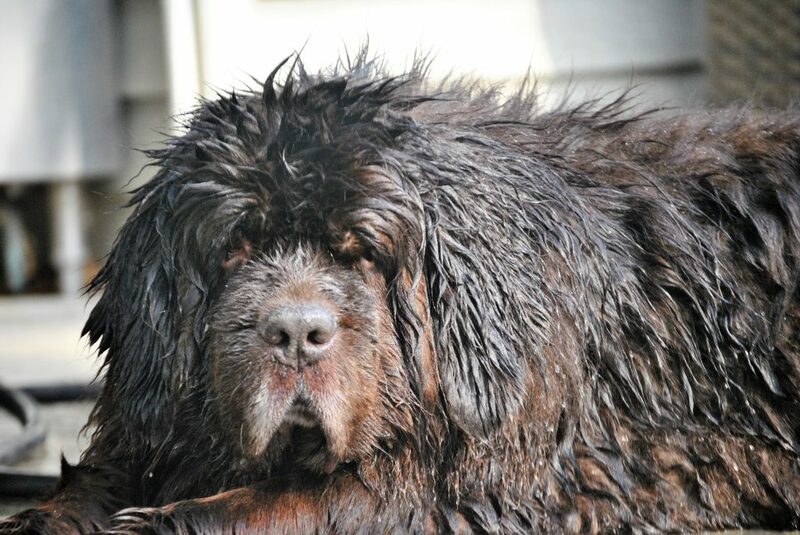 There’s no correct answer to how often a Newfoundland should get a bath. 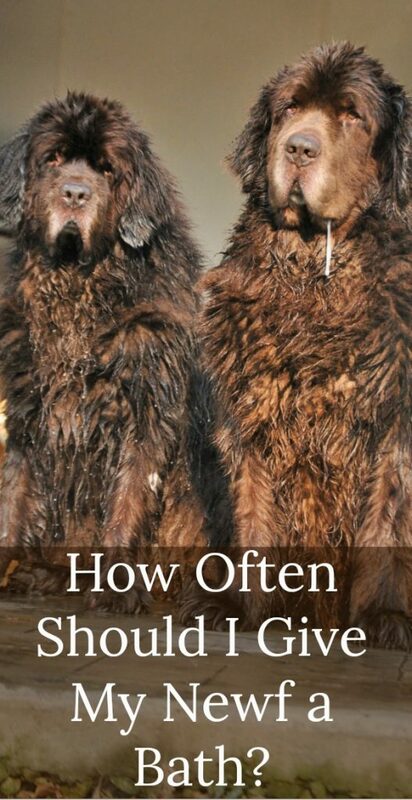 I don’t know what’s written in the Newfie handbook but my advice would be to give your Newfie a bath when they need one. Do they swim often? Do they have skin issues? Do they roll in poop? Do they have crusty slobber dried on certain body parts? Do they lay in the house all day? Before you give your Newfoundland a bath you should first comb and brush the entire dog. Brushing and line combing is what really keeps the coat healthy. Remember that Newfs have a double coat. Their outer coat catches the dirt and debris so brushing that out daily helps to clean the coat and remove loose hair. You’ll also want to remove any mats before you wet the coat. Mats on a dog will only get worse when they are wet so removing them with a mat splitter, greyhound comb or clippers is recommended. Mats usually like to form under the front leg (think armpit), on the hair on the front legs, on the back legs, on the inside of the thighs, behind the ears and on the bottom of the pads. You can also blow their coat out with a high velocity blow dryer. This not only removes debris and loose hair but also blows out the dust and dander making bath time much easier and productive. You’ll want to spray the dog with lukewarm to saturate the coat down to the skin. This may take a little bit of time because Newf’s have a waterproof coat and just when you think they are wet enough they shake and look completely dry! Be patient and keep that water flowing. Be careful around the face, especially the eyes and if you’re concerned about getting water in the ears, you can gently place a cotton ball in each ear for the bathing process. When the coat is wet you can apply the shampoo. Make sure that if you’re using a concentrate shampoo that you dilute following the directions on the bottle. Lather up the shampoo making sure to reach the skin. When you’ve applied and lathered the shampoo on the entire dog, rinse, rinse and rinse some more. Make sure all of the shampoo has been washed away. Leaving shampoo on the coat and skin can cause irritation and leave a flaky residue behind. Using your high-velocity dog dryer start at the top of the dog and work your way down. You’ll want to blow dry the way that the coat lays and pay attention to the skin as you go. 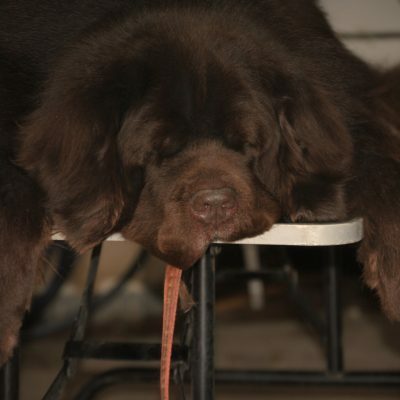 This is a great time to check your Newf’s skin for any issues such as sores, flakey skin, hot spots, ticks, and fleas. Using a brush as dry is a good way to remove some of the water from the coat and try to stay away from blowing in circles. This will cause the hair to twist and become knotted and it’s not fun to try and unknot it when it happens. 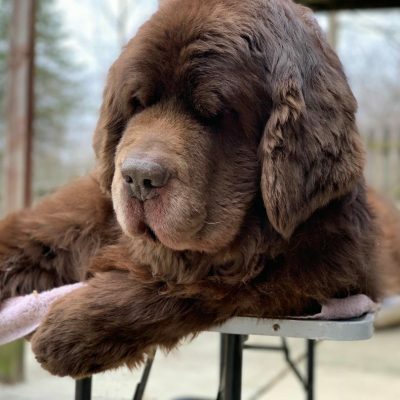 Completely drying a Newf can take up to a few hours depending on what type of dog dryer that you have but making sure that it’s dried down to the skin will help hot spots from forming. 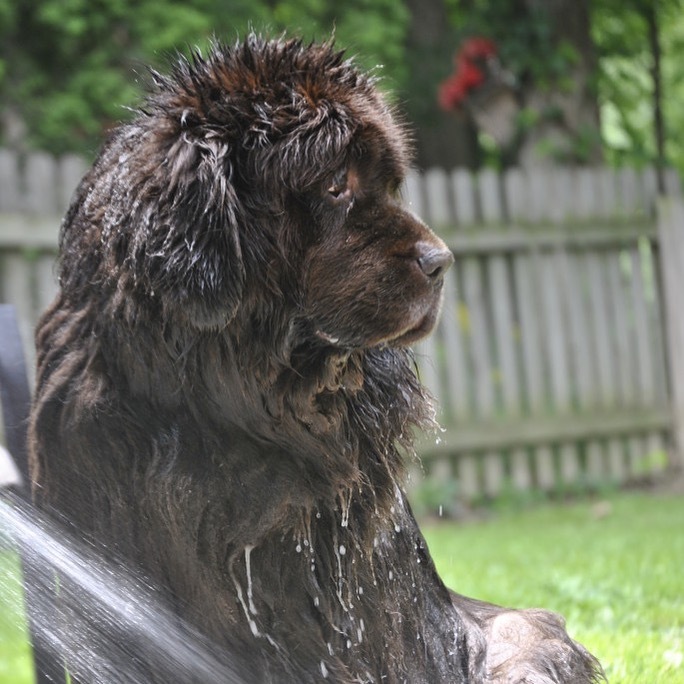 It’s not recommended to use a human blow dryer on a Newfoundland because it can become too hot and burn the skin. Not to mention it does not have enough power to dry a double coated breed. 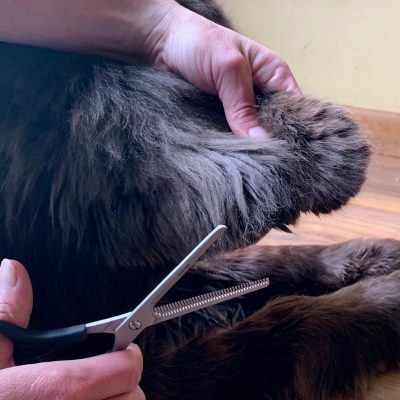 The next step would be to trim your Newfoundland but if you’re leaving the trimming to a professional then the next step would be to give your dog a special treat or tons of praise for being such a patient Newf during their at-home spa day! That’s great that your itchies go away with a bath! Callie and Shadow always went/go to the groomer every 3-4 months. There’s no way I could lift either one of them into the tub once they were full grown. Ducky gets a bath “as needed” during the day when she’s at daycare. In between, I brush them both. Ducky is quick and easy with her short, Lab-like, coat. Shadow takes a while with her double coat. Yes. That double coat does take awhile! One needs a lot of time and patience to get a Newfie dry! My Roxy girl gets one about every week or every two weeks really just depends on what kind of events we have coming up with kids and adults and stuff like that she is a therapy dog so she has to always be clean and looking her best she loves her baths she’s always and willing to get up in the tub and jumped on the table and stand there to be hand blow-dried and brushed and combed out and it doesn’t help them that Mom does work at a grooming place, but she also has her free time to be a newfie she loves to dig especially when it’s muddy. That is great that your mom is a groomer! I bet she has all the tools! Our shelties can go 5-6 weeks to get bathed at the groomers unless (usually Katy) decides she needs a mud treatment that requires a tubby at home. I bathe several times a month. Jaxson’s always in the salt water, Harley is at the hospital once a week, my husband and I don’t like dirty dogs, etc… Like you said – it depends on the dog. I’ve bathed Jaxson and not Harley a few times – Harley wasn’t stinky. We tend to agree with you though Sam thinks all H2O encounters should be ended immediately. Sadly, he’ll be getting one soon as we’ll be going to the hospital and he has to be bathed for those visits every month. But please don’t tell him just yet. ? My 4 1/2 month old newfie has had like 60 baths -if we include the self induced shampoo-free types in the hose and kiddie pool. Oh, wait…61… he jumped in my tub as I tried to get out the other morning!! He’s had probably 4 real baths (real=with shampoo) but I’m hoping once his difficult grown-up coat is in I’ll be able to take care of a lot with brushing… I did discover that secret Tuesday, after he had a muddy slobbery play date with an older cousin on Halloween night!! Dried slobber and mud brushed out pretty nicely, but still one of those four real baths was later in the week. He certainly does choose a wet state over a dry state if it is an option. Unless soap is involved, of course. Then somehow the same situation sends a shiver up his little spine.